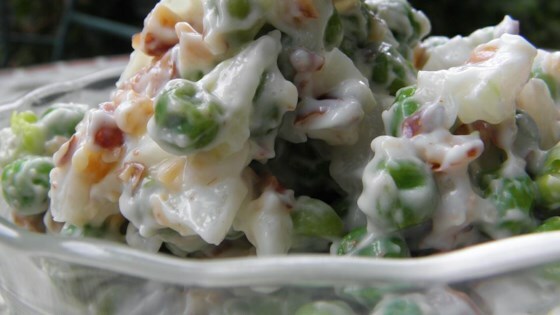 "This is the pea salad everyone begs for at any event or anytime we make it. Easy and so addictive. Most folks are sure there is bacon in the recipe, but there is none needed for the fabulous flavor." Place frozen peas in a colander; rinse under cold water until thawed. Drain and transfer to a large bowl. Add almonds and onions; mix well. Fold mayonnaise and black pepper into pea mixture until evenly coated. Cover and refrigerate until serving. I think the chopped smoked almonds is a fantastic idea that I will be adding to other salads as well! I also added some grated cheddar and a little red wine vinegar and sugar to the mayo. Tasty and easy! I added more mayo, however. OMG this was so good. I will make again and again. Thought this combo was delicious! To those of you wondering about the "white and brown chunks", am sure those are pieces of onion and the chopped almonds.